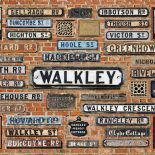 A new book has been published about Walkley designers and artists Omar Ramsden and Alwyn Carr. Helen Ashton has written the history after discovering that Omar was connected to her family. Omar Ramsden and fellow Sheffield-born designer Alwyn Carr set up a partnership in 1898, and moved to London to become some of the most successful silversmiths of the early 20th century. This entry was posted on April 11, 2018 by Bill Bevan in News, Uncategorized.